Mia was original a street cat who then spent a couple months in a foster home with a couple of her siblings. She's about 6 months old and a real little sweetheart. 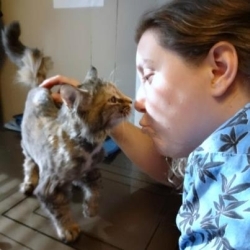 Her coat was so matted from her time as a stray that she had to be completely shaved. She was downstairs in our display kennel to be socialized when a client fell in love with her. 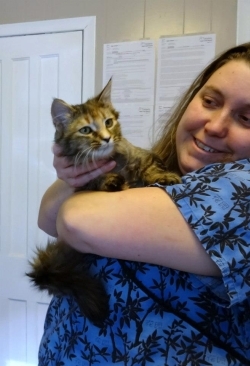 Mia will be heading off to her new home just as soon as we can get her spayed. Congradulations Mia!